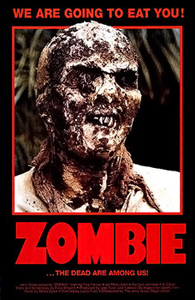 Also released as Zombie and Zombie Flesh Eaters this classic zombie flick was inspired by Dawn of the Dead and it is easily Italian director Lucio Fulci's best film. The memorable opening features a boat floating into New York harbour with a zombie onboard. The boat belonged to the father of Anne Bowles and after finding a cryptic note she embarks with a reporter to a mysterious island called Matool to find him. The island is crawling with zombies and they barely escape again. The film is mainly remembered because it features an awesome battle between a shark and a zombie. There is also a seriously nasty scene where a splintered bit of wood is forced slowly into a woman�s eye. The film is a total gore-fest and it was banned in the UK for several years. The acting is not great and the dubbing is terrible but if you like gory zombie action this is a must see.